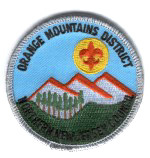 For information about the current Commissioners in Orange Mountains District, please click here. What is the Commissioner Service and How is it Organized? What types of Commissioners are there? What are their purposes and goals? Youth experience Scouting in Packs, Troops, Crews, Teams, and Posts. The healthier the unit, the more wonderful the things that will happen for these youth. To help make this happen, the Boys Scouts of America provides a program of unit service through adult Scouters specifically commissioned to help chartered organizations and unit leaders to achieve the aims of Scouting by using the methods of Scouting. These commissioned Scouters wear a shoulder patch with a wreath surrounding the Scout symbol. This includes the District Commissioner and the Assistant District Commissioners. Their primary responsibilities are recruiting, training, guiding, and evaluating the Commissioner staff. In larger Districts, you may find that their are line managers and specialty advisors within the Commissioner staff. For example, you may have Assistant District Commissioners that manage several Unit Commissioners in a Service Area and others that specialize in rechartering, training, or the administration of the Commissioner service. 5. Help assure that Scouts and units take an active part in District and Council activities. d. Constantly evaluate the success of the unit in providing a quality program and communicating the status of the unit to the ADC. Unit Commissioners should use the "Unit Commissioner Work Sheet (Pack)", "Unit Commissioner Work Sheet (Troop)", and "Unit Commissioner Work Sheet (Crew)" to review the status of each unit. Each work sheet has dozens of helpful suggestions on helping the units to do a better job. Use judgment as to when it is appropriate to offer recommendations. These work sheets are available in the back of your Commissioner Fieldbook and may be reproduced as needed. Anyone interested in serving as a Commissioner is encouraged to contact the District.